Flags are powerful symbols that evoke loyalty and patriotism from a nation or group of people. It is surprising that many churches and Christian organizations fly the American flag above (or instead of) the Christian flag. It seems many Christians are not taught that salvation involves a change of king and country. Paul tells us that God “has rescued us from the dominion of darkness and brought us into the kingdom of the Son he loves” (Colossians 1:13). We used to be citizens of Satan’s kingdom, which includes all the nations of the world (Matthew 4:8). But now we are citizens of God’s kingdom, which is the church of Jesus Christ (Ephesians 2:19-22). We used to be citizens of America, but now “our citizenship is in heaven” (Philippians 3:20). Those who belong to Jesus are citizens of His kingdom and owe Him their allegiance. It’s no secret that Americans are unsatisfied because they aren’t getting the return they deserve for their patriotism. The kingdom of God is the only nation that fully satisfies its citizens. 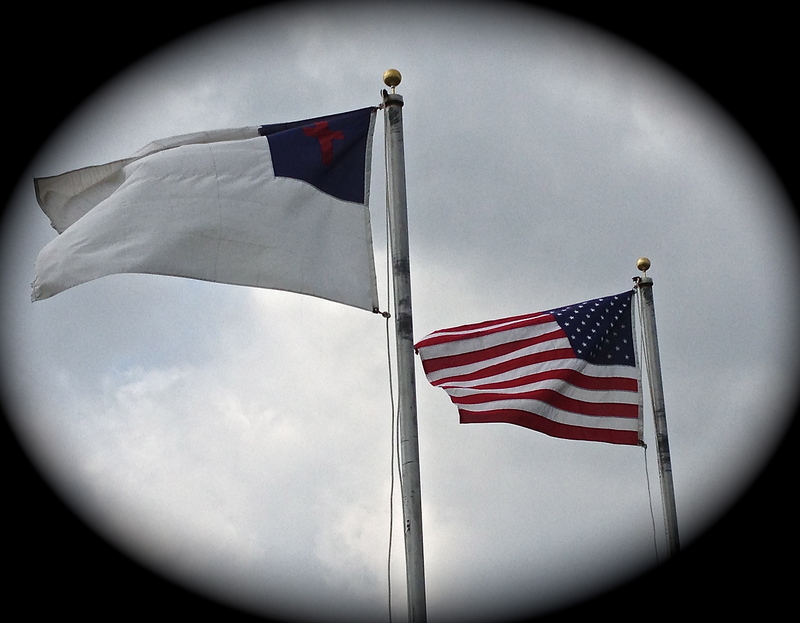 It is foolish to pledge allegiance to America after being saved, because the kingdom of God is better than America. America became a nation when it declared independence from Great Britain on July 4, 1776. It was founded upon the belief that “all men are created equal” and are endowed with “certain unalienable rights.” Its founding fathers are regarded as men of high character and conviction. The church became a nation when Jesus poured out His Spirit on the Day of Pentecost (Acts 2). It was founded upon the belief and proclamation that Jesus is “the Christ, the Son of the living God” (Matthew 16:16-19; Ephesians 2:20). The kingdom of God has a better foundation because Jesus its founder is divine and eternal. The Constitution is America’s guiding document. It establishes the doctrines of “separation of power” and “federalism,” and gives procedures for amending and ratifying it. It went into effect in 1789 and has already been amended twenty-seven times! The Bible is the church’s guiding document. It is “God breathed” and “able to make you wise for salvation through faith in Christ Jesus” (2 Timothy 3:15-16). It was ratified in the fourth century A.D., but it cannot be amended. The kingdom of God has a better constitution because the Bible is the complete revelation of God. America is a republic – power is held by the people and their elected officials. Its federal government is divided into legislative, executive, and judicial branches. These branches exercise their power through Congress, the President, and the Supreme Court. The church is a monarchy – power is held by an individual. God established Jesus as its head and ruler by raising Him from the dead (Acts 2:29-33; Ephesians 1:20-23) and endowed Him with “authority, glory and sovereign power” (Daniel 7:14). Jesus is a good king who cares about the well-being of His subjects. The kingdom of God has a better government because Jesus is a righteous king who reigns forever. The church has existed longer and endured more persecution. Its warfare is more effective, its citizenry is more diverse, and its future is more secure. Its contributions to culture and mankind are astounding, and its citizenship is immediately available to all. The kingdom of God has a better heritage because the church is highly inclusive, influential, and indestructible. I”d love to hear from you – share your thoughts by leaving a comment! Is there really a Christian flag on the market? I am a Christian and taking on three sometimes four bible studies a week. I can not get enough and love my Christian friends.